Architect Marc Kushner takes a quick look at some interesting buildings in his book The Future of Architecture in 100 Buildings. The volume may be slight, but the ideas posed are huge. How much does interesting cost? Have we been thinking about windows all wrong? Can we find salvation in paper tubes? These are design questions we can ask about any structure, even your own home. Marc Kushner suggests that picture-taking smartphones have created a culture of critics, sharing their likes and dislikes, and "changing the way architecture is consumed." "This communications revolution is making us all comfortable critiquing the built environment around us, even if that criticism is just 'OMG I luv this!' or 'This place gives me the creeps.' 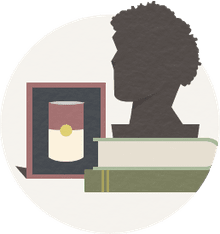 This feedback is removing architecture from the exclusive purview of experts and critics and putting power into the hands of the people who matter: everyday users." We live and work in architecture. 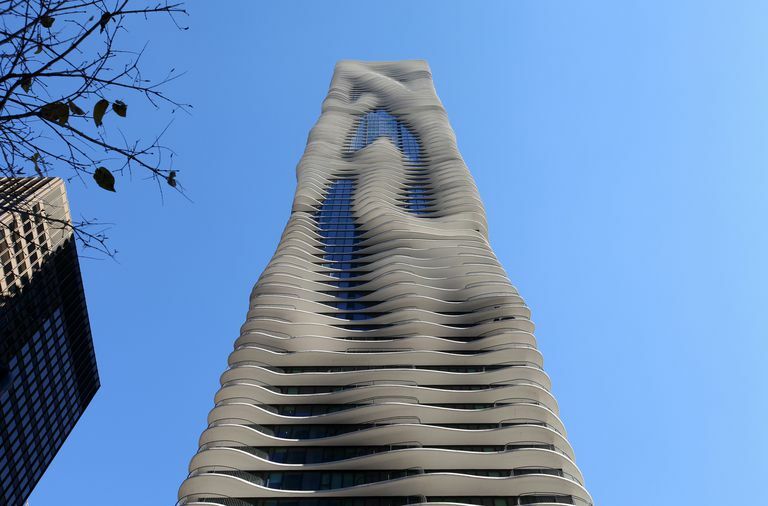 If you are in Chicago, the multi-use Aqua Tower might be the place to do both. Designed by Jeanne Gang and her Studio Gang architectural firm, this 82-story skyscraper appears like a beachfront property if you look closely at the balconies on each floor. Take a longer look at Aqua Tower, and you'll be asking yourself what architect Marc Kushner asks: Can balconies make waves? Architect Jeanne Gang created an amazing, illusionary design in 2010—she tweaked the sizes of the individual balconies of Aqua Tower to create an entirely unexpected facade. This is what architects do. Here we explore a few of Kushner's questions about architecture. Do these beautiful and provocative structures suggest the future design of our own homes and workplaces? Why do we continue to use traditional building blocks in the same old way? One look at the glass facade of the 2011 Harpa in Reykjavík, Iceland, and you'll want to rethink the curb appeal of your own home. Designed by Olafur Eliasson, the same Danish artist that installed waterfalls in New York Harbor, Harpa's glass bricks are an evolution of the plate glass famously used in homes by Philip Johnson and Mies van der Rohe. Architect Marc Kushner asks, Can glass be a fortress? Of course, the answer is obvious. Yes, it can. Instead of downsizing, why don't we build temporary wings onto our homes, extensions that will last just until the kids leave home? It could happen. Japanese architect Shigeru Ban was often scorned at his use of industrial building materials. He was an early experimenter of using shipping containers for shelters and cardboard forms as beams. He's built houses without walls and interiors with movable rooms. Since winning the Pritzker Prize, Ban has been taken more seriously. Can we find salvation in paper tubes? asks architect Marc Kushner. The earthquake victims in Christchurch, New Zealand think so. Ban designed a temporary church for their community. Now known as the Cardboard Cathedral, it should last 50 years—time enough to rebuild the church destroyed by the 2011 earthquake. How can a city's decision influence a typical homeowner? Look to Seville, Spain and the Metropol Parasol built in 2011. Marc Kushner's question is this—Can historic cities have futuristic public spaces? German architect Jürgen Mayer designed a space-age-looking set of umbrellas to lightly protect the Roman ruins uncovered in the Plaza de la Encarnacion. Described as "one of the largest and most innovative bonded timber-constructions with a polyurethane coating," the wooden parasols contrast perfectly with the historic city's architecture—proving that with the right architectural design, the historic and the futuristic can live together in harmony. If Seville can make it work, why can't your architect give your Colonial home the sleek, modern addition you desire? Computer software has changed the way structures are designed and built. Frank Gehry didn't invent the curvy, swirly building, but he was one of the first to take advantage of designing with industrial-strength software. Other architects, like Zaha Hadid, took the form to new levels in what has become known as parametricism. Evidence of this computer-designed software can be found everywhere, including Azerbaijan. Hadid's Heydar Aliyev Center brought its capital, Baku, into the 21st century. Today's architect is designing with high-powered programs once used only by airplane manufacturers. Parametric design is just part of what this software can do. For each project design, construction material specifications and laser-guided assembly instructions are part of the package. Builders and developers will quickly get up-to-speed with new processes of construction at every level. Author Marc Kushner takes a look at the Heydar Aliyev Center and asks Can architecture swoop? We know the answer. With the proliferation of these new software programs, designs of our future homes may swoop and curl until the cows come home. "New construction is wildly inefficient," claims architect Marc Kushner. Instead, existing buildings should be reinvented—"A grain silo becomes an art museum, and a water treatment plant becomes an icon." One of Kushner's examples is the Newtown Creek Wastewater Treatment Plant in Brooklyn, New York City. Instead of tearing down and building anew, the community reinvented the facility, and now its Digester Eggs—the part of the plant that processes the sewage and sludge—have become iconic neighbors. Reclaimed wood and bricks, architectural salvage, and industrial construction materials are all options for the homeowner. Suburbanites are quick to buy "knock-down" structures only to rebuild their dream homes. Yet, how many small, country churches have been transformed into dwellings? Could you live in an old gas station? What about a transformed shipping container? The Tate Modern, a popular art museum in London, used to be a power plant. Architects Herzog & de Meuron won the Pritzker Architecture Prize a year after this adaptive reuse project opened. Hemeroscopium House in Madrid, Spain, took a year to design but only a week to build. The house was constructed in 2008 with the kind of precast concrete beams most often seen in parking garages and along superhighways. Ensamble Studio, led by architects Antón García-Abril and Débora Mesa, are the minds behind this rethinking. Architect Wang Shu, another Pritzker Laureate, used earthquake rubble to create the facade of Ningbo History Museum in China. "We can create a new future for our existing buildings by repurposing our past," says Marc Kushner. We always can learn from architects we've never heard of—if we open our minds and listen. Shapes can change, but Can architecture drip? The huge architectural firm of Skidmore, Owings, & Merrill (SOM) designed Terminal 2 at the Mumbai airport with welcoming light that filters through the coffered ceiling. Examples of architectural coffering can be found around the world and throughout much of architecture's history. But what can the ordinary homeowner do with this detailing? We can take suggestions from designers who we don't even know by simply looking around at public designs. Don't hesitate to steal interesting designs for your own home. Or, you could just take a trip to Mumbai, India the old city that used to be called Bombay. Museo Soumaya at Plaza Carso was designed by Mexican architect Fernando Romero, with a little help from Frank Gehry, one of the masters of parametricism. The facade of 16,000 hexagonal aluminum plates are independent, not touching each other or the ground, giving the impression of floating in air as sunlight bounces from one to another. Like the Harpa Concert Hall in Reykjavík, also built in 2011, this museum in Mexico City speaks with its facade, compelling architect Marc Kushner to ask, Is pretty a public amenity? What do we ask our buildings to do for us aesthetically? What does your house say to the neighborhood? Homeowners spend a lot of time with various exterior siding choices for their houses. Architect Marc Kushner suggests that the single family home hasn't even begun to consider all of the possibilities. Can architecture be pixelated? he asks. Completed in 2007 as the headquarters of Prisma Engineering in Graz, Austria, the Frog Queen as it is called is nearly a perfect cube (18.125 x 18.125 x 17 meters). The design task for the Austrian firm SPLITTERWERK was to create a facade that protected ongoing research inside its walls while at the same time be a showcase for Prisma's work. Like Jeanne Gang's Aqua Tower, the up-close facade of this building in Austria is not what it appears in the distance. Each nearly square (67 x 71.5 centimeters) aluminum panel is not a shade of grey, as it looks like from a distance. Instead, each square is "screen-printed with the various images" that collectively creates one shade. The window openings, then, are virtually hidden until you approach the building. Various flowers and gears are perfectly lined up to create the shadows and shades of grey seen on Frog Queen from afar. No doubt, these are prefabricated and pre-painted aluminum panels artistically designed with a computer program. Yet, it seems so simple a task. Why can't we do that? The architect's design for Frog Queen allows us to see potential in our own homes—could we do something similar? Could we create an artful facade that entices someone to come closer? How close do we have to embrace architecture to truly see it? Architecture can keep secrets, concludes architect Mark Kushner.